Leone C. Bolin. Coral Gables, 1950. Oil on canvas, 20 by 24 inches. Leone Bollin taught at Emile Roure’s Miami Art School. Her scenes of South Florida were exhibited throughout the state. Bollin’s painting, Ship On The Ways was reproduced in the Miami Herald, Sunday supplement, December 29, 1940, along with several other Miami paintings, under the title, The Artists View Miami. Her address that year given as 1454 N. W. Eighteenth Avenue. Later Bolin had a studio at 1133 Mariana Avenue, Coral Gables. She was listed in Who’s Who in American Art, Who’s Who in the Southeast and Who’s Who of American Women. Born: December 8, 1893, Bluffton, Indiana. Education: Chicago Academy of Fine Arts; American Academy of Art, Chicago. With Jerome P. Uhl and Irving Manoir. Membership: Miami Art League; Gables Grove Artists, president, 1948-1950, later the Coral Gables Art Club; Florida Federation of Art, Chairman, membership committee, 1945. 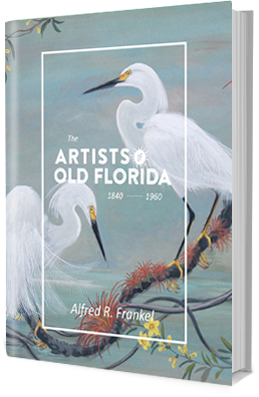 Exhibits: Florida Federation of Art, prize, 1940; Miami Woman’s Club, March, 1942, gold star; Miami Art League, Miami Associated Artists new gallery, 1822 Biscayne Blvd, April 1943; Florida Federation of Art, 16th Annual, St. Petersburg, December, 1943, honorable mention, Miami River; Coconut Grove Housekeeper’s Club Exhibit, January 1945, a group of Seminole scenes; Miami Art League, Burdine’s Department Store, November 1945; Miami Art League Annual, Miami Beach Art Center, November 1946, Joven Paquita in War Paint; Coral Gables Art Club, 1st Annual, November 1950, Hoisting Canvas; Miami Beach Outdoor Art Fair, January 1951, Lord Tarleton Hotel, Everglades Indian Village; Coral Gables Art Club, Coral Gables Country Club, October 1951, Prado-Late Afternoon.